A classic boxer versus puncher style matchup headlines a loaded tripleheader on Showtime this Saturday night. 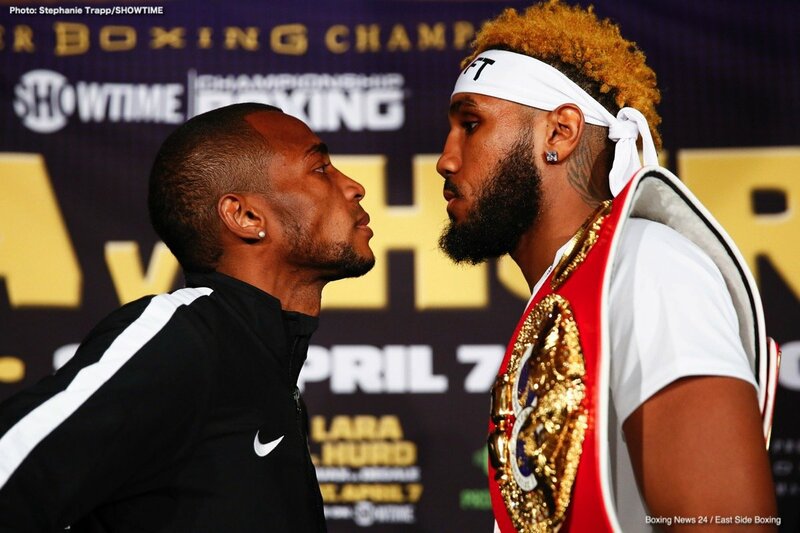 Erislandy Lara and Jarrett Hurd engage in a junior middleweight unification bout, a division the network has focused on for a better part of two years. The co-feature is a rematch from one of the biggest upsets of 2017, Caleb Truax versus James Degale. On paper, the potential is there for this stacked card being the best of the year thus far. Cuban stylist Erislandy Lara is not a fan favorite sadly you’d be hard pressed to find many media members or fans that even respect him. Some of the sentiment comes from the paying customer, rightfully not satisfied with the non-action in the 2014 Canelo fight. Some of it is style preference, most it seems now, are sick of Lara talking about fighting Gennady Golovkin but in reality, only testing himself once since 2014 against Vanes Martirosyan. On the way up the ladder Lara looked every bit the part flashing speed, movement, and clean-punching. His performance versus Paul Williams was damn-near flawless, regardless of the ridiculous outcome. His battle with Alfredo Angulo showed heart and his talent shined through by dismantling a prime Austin Trout. Lara’s weakness is punch output and every once in a while a lack of focus on defense. In the past, Lara’s bad habit of using an ear-muff defense has gotten him in trouble on the judge’s scorecards. A perfect example is his fights with Carlos Molina and Vanes Martirosyan, especially the first go around. Jarrett Hurd busted on the scene in late 2015 by stopping Frank Galarza on ShoBox: The Next Generation. Hurd followed up that victory by taking care of then unbeaten, Oscar Molina via 10th-round stoppage on the undercard of Thurman vs. Porter on CBS. Jarrett finished off 2016 strong, heading into 2017 all guns blazing in effort of a title shot. 2017 was a difficult yet rewarding year for the Maryland native. In both outings it looked as thought Hurd would lose, getting down early on the scorecards. Tony Harrison was out-boxing Hurd until Tony was hurt and not long their after, stopped in the ninth round. Hurd’s toughest test came last October, in a tooth-and-nail scrap that saw Austin Trout ahead early. Not only was Trout doing what Harrison had from a tactical standpoint, he was also landing harder shots, especially ripping upper cuts. Hurd wouldn’t be deterred and eventually started to catch Trout with power shots to the head and body. Jarrett is facing a talented slickster with razor-sharp accuracy and solid fundamentals. Can Hurd rely on wearing down Lara and eventually closing the gap in order to release his best weapons? Saturday night will tell us a lot about both men. Does Lara still got it, or has his prime years slipped away having aged and not truly tested for a while? Is Jarrett the new face of the 154-pound division or will his ruthlessness finally catch-up with him? To no one’s surprise, Erislandy Lara will grab an early lead and could possibly be up 5-1 or say 4-2 at the halfway point. That’s when the fight will change, Hurd’s activity and pressure will begin to take hold, or Lara enters boxing’s version of a prevent-defense we see too often in football. Lara would be completely satisfied to milk the clock and glide to an effortlessly performance. However, that won’t happen on Hurd’s clock due to his will power to break a man down at all cost. Don’t get me wrong, his face-first strategy may not work but it won’t stop him from trying. If Lara wants to win this fight clearly he will have to up his punch output similarly to his war with Angulo. Combination punching will be a must as will shorter stints on the ropes instead of resorting to ear muff mode. The second half to this main event unification will be an action packed, give-and-take affair that will likely feature shaky moments on both sides. Look for Lara to take a page out of Austin Trout’s book by counter-punching the come-forward Hurd. The difference is unlike Trout Lara has quick feet and quicker hands, allowing him to invade more incoming power punches. Hurd’s reiterated he has worked on head movement and footwork. He swears up and down he will be more responsible coming in. Hurd has said that a few times now and each time nothing has really changed. We could see some minor adjustments but once he’s down early, Hurd will push forward despite the dangers involved. My Official Prediction is Erislandy Lara by Majority Decision. The co-feature is a great matchup on paper in a rematch from Caleb Truax’s unbelievable upset last December. Truax crossed the pond and hit the ground running snatching Degale’s IBF world title. Pressure busts pipes, and it was James Degale who looked like a broken fighter lingering far too long on the ropes. It would be wise for Degale to use lateral movement and an active jab to keep a focused Truax off of him. If Degale doesn’t arrive in tip-top shape physically and mentally, this time he will get stopped. Even though Truax took Degale’s belt he still sits as an underdog on the betting books. Motivated and still basically care-free, Truax will have an extra chip on his shoulders. This rematch will definitely be a lot more competitive and should give headaches to fans trying to score rounds. My Official Prediction is a Draw. Side Note: The opening bout pits one-loss foes Jullian Williams and Nathaniel Gallimore in an IBF 154-pound eliminator. This matchup will not only produce some fireworks, it could steal the show of a deep Showtime Tripleheader.